Ever since the first practical utilization of gas and oil engines and the satisfactory demonstration of their applicability to general power purposes, builders of such engines have sought to cultivate special fields in which to secure new employment for the motors and, as a consequence, they are found at the present time performing the widest variety of services. Not only as stationary, but also as portable engines, mounted on trucks, for purposes, as fire engines, pump1ng engines capable of being rapidly taken from place to place, as locomotive engines driving road carriages, and as marine engines for propelling launches, as instanced repeatedly in the preceding papers, they are successfully used. In fact, there is no line of work that can be readily called to mind in which they are not now either successfully operated, or to which they do not promise to lend themselves with satisfaction. They are no longer the clattering, noisy engines of early years, nor have they retained the excessive bulk and great weight for even moderate powers which characterized some of them when first brought out; instead, they have been made surprisingly quiet in operation, and in size and weight have been brought down almost to the figures ruling in steam engine practice, so that, for the same powers, a modern gas or oil engine and an average steam engine are not very unlike. 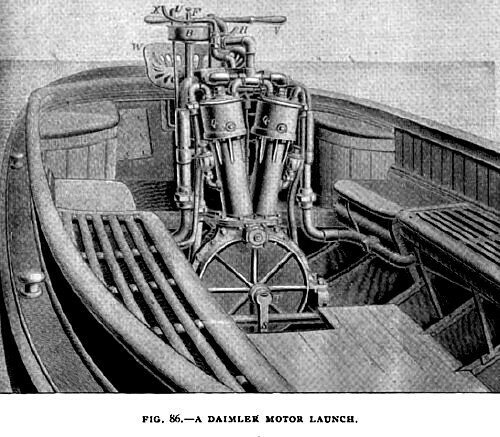 Among the many oil engines which probably first became best known in the United States as specially applicable to launch propulsion is the Daimler motor, built in this country by the Daimler Motor Company, of Steinway, Long Island City, N. Y., and introduced also in England by Messrs. Sims & Co., of London. 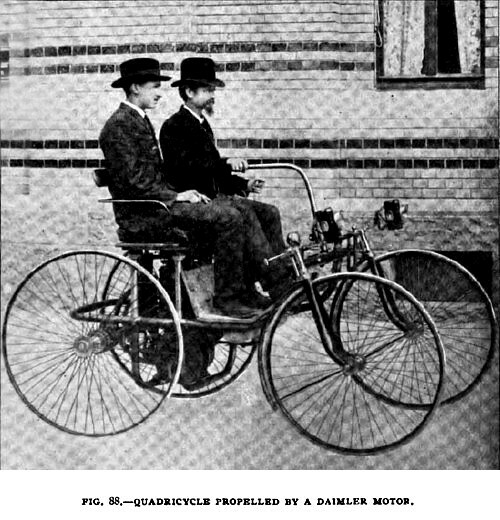 The engine is designed for the use of either gas or gasoline, and is the invention of Mr. Gottlieb Daimler, of Cannstatt, Germany, who for many years was associated with the late Dr. Otto. It is by no means, however, restricted to launch use, but is applicable to all the several motor purposes for which the various engines of its class have been employed. Figs. 82 and 83 represent different views of a single-cylinder Daimler motor. Fig. 84 shows a double-cylinder design, the motor, it being proper to state here, being made with one or more cylinders according to the power required. Thus, while the smaller sizes are of the single and double-cylinder designs here illustrated, the five and ten-horse-power engines have four cylinders placed side by side. The principle of operation, however, and the main features of construction are the same in all the engines. For the purpose of our explanation of the manner of working we will take the single-cylinder engine, the cycle of operations applying equally well to all the others, being simply multiplied in number with the increase in the number of working cylinders. Fig. 87 represents a vertical section of one of the engines along the line of the shaft and clearly illustrates the character of the internal construction, the valve mechanism, governor connection and other important working details. Within the base of the motor, which consists of a cast iron circular chamber, are arranged two crank discs, mounted upon the two sections of the main shaft and connected by the crank pin, the crank discs serving also the purpose of fly wheels. In one of the discs is formed a double cam groove which passes twice around the crank-shaft and returns into itself. In this cam groove works a follower, or two followers in the case of a double cylinder engine (see Fig. 85), operating the exhaust valve gear so as to make every other stroke a working stroke, and thus maintaining the Otto cycle. When two or more cylinders are used, they are arranged either parallel with one another, or they are inclined so as to form a slight angle. In the double cylinder engine both connecting rods work on the same crank pin, and both pistons, therefore, move up and down together; but on the down-stroke one of them is always moving under the impulse of an explosion, while the other is drawing a working charge into its cylinder and on the up-stroke one of them is always expelling the waste gases, while the other is compressing a charge. Ordinarily, therefore, there is in the double-cylinder engine an explosion in either one or the other cylinder at every revolution of the crank-shaft. In the engine as arranged for working with gasoline, A (see Fig. 82) is the carburetor; O is the exhaust pipe which is provided with a perforated casing through which the air is drawn on its way to the carburetor, becomes warmed before it reaches the latter, and is thus better able to become impregnated with gasoline vapor. From the carburetor the mixture goes through the valve H which also admits an additional air supply through the open-end, curved pipe, shown at the left, and the charge finally reaches the valve chamber. The small valve F regulates the supply of gasoline to the burner D, which heats a platinum ignition tube C. With this ignition tube heated to redness and a few turns given to the engine by means of the crank handle S to draw in the initial working charges, the engine will proceed regularly with its work. A vertical section of the cylinder, valves and crank chamber is given in Fig. 86. The admission valve is held to its seat by a spring and opens inward under the influence of the partial vacuum formed in the cylinder by the suction stroke of the piston. The exhaust valve is similarly kept closed by a spring while the admission valve is open, and is pushed upward and opened to permit escape of the waste gases from the cylinder at the charge of explosive mixture can obviously not enter. No impulse can, therefore, take place in the cylinder until the speed has become slower and the exhaust valve rod has been allowed by the governing gear to resume its original position where it can strike the exhaust valve spindle and open the valve. The pipe R, Figs. 82 and 83, is one of the water circulating pipes delivering cooling water from a small pump, marked 2, to the jacket Q around the cylinder, another pipe returning the water, which may be used over and over again, to a tank marked 1. Where some other source of water supply is available, the tank and pump may, of course, be dispensed with. In fact the design shown in Fig. 83 is now but little used. With the pump and tank attachment, however, the motor is entirely self-contained and can be used anywhere, without dependence upon either gas or water mains. The tank I, Fig. 82, serves for gasoline storage and can be conveniently located, outside of the building if desirable. A float index E on the carburetor A, indicates the level of the gasoline within. When the carburetor is completely charged, the supply will last about five hours. Where the reserve tank I is applicable it will be necessary to charge the outfit only once a day for a running time of ten hours. When gas is available the carburetor and reserve tank naturally are done away with, and the engine assumes a somewhat simpler appearance, as shown, for example, in the illustration of the double-cylinder motor. The single cylinder design is followed for sizes up to one horse-power; beyond that, two and four cylinders are employed. In the four-cylinder engines, and also in some of the two-cylinder engines as built in Germany, the cam-groove exhaust valve gear as here described is not used, but in its place a separate cam shaft, driven by gearing from the main shaft is employed. The general features of design and the manner of working are, however, exactly the same. When used for boat propulsion, the motor is generally completely boxed in so as to protect it against the weather, and is fitted with a suitable reversing gear. Being of German origin, the engines having first been built by the Daimler Motoren Gesellschaft, of Cannstatt, which is still making them, it is only natural that in Germany and in Europe generally we should find the motor applied most extensively and to the widest variety of uses. At Stuttgart, for example, it is in successful operation in propelling a street car. It has also been applied on some of the German railroads to driving small inspection cars, similar to the familiar hand cars, and has similarly found favor for the propulsion of road carriages, quadricycles and even bicycles, not to mention the large number of pleasure boats which are equipped with it. The English firm of Sims & Company, of London, are actively prosecuting the introduction of the motor into British territory. Before finally leaving the Daimler motor a little more information concerning the carburetor used may not be amiss. A sectional view of it, with some of its accessories is, therefore, given in Fig. 89. The lower part of the apparatus consists of a small tank H, containing a float B, which rests upon the gasoline. The float is provided with a central funnel which communicates with the main body of the liquid in the tank through a small opening at the bottom, so that while the liquid is maintained at a constant level in the funnel, it is practically isolated from the main body of the petroleum. The float is provided with an air tube entering the funnel, and perforated below the surface of the gasoline. This air tube slides freely in the tube F, attached to the cover of the apparatus and acting as a guide, allowing the float to rise and fall according to the supply of gasoline. Hot air is admitted to the carburetor through the pipe attached to the upper part of the apparatus, the air being heated in its passage to the carburetor by the products of combustion as already explained in describing the engine proper. 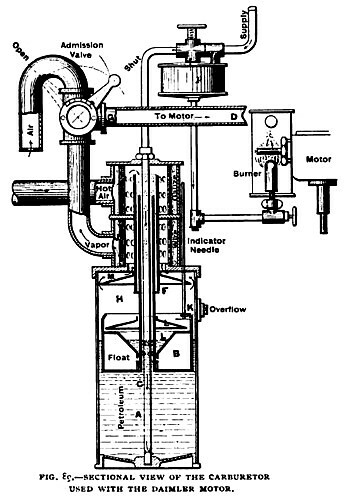 The carbureted air passes through the vapor pipe in the direction indicated by the arrow, and unites with a stream of air drawn into the motor cylinder through the admission valve at G. This valve is provided with a graduated scale which facilitates the adjustment. It has also an automatically operating safety valve. The reservoir is filled through a supply pipe extending down to the bottom through the air tubes and float. The supply pipe communicates with the lamp font p, which furnishes the oil to the burner, by means of which the ignition tube is heated. The time required for heating the latter and starting the motor is inappreciable. The motor may be stopped temporarily by shutting off the supply of combustible gas, allowing the ignition tube burner to continue burning. For a complete stop, however, the ignition tube burner is extinguished in addition to shutting off the gas. One of the most interesting and ingeniously designed gas engines put on the market by English makers is the Atkinson differential engine, first brought out eight or nine years ago by the British Gas Engine & Engineering Company, of London. The main object sought after in this engine was to allow the exploded charge to expand much more rapidly than is usual or possible in most other gas engines, and to thus be in contact with the relatively cold cylinder walls for a shorter period of time. In this way, it was agreed, an important economical end is served. The engine in its earliest form is shown diagrammatically in Figs. 91 to 94, from which the main peculiarities of its operations will be more clearly understood. 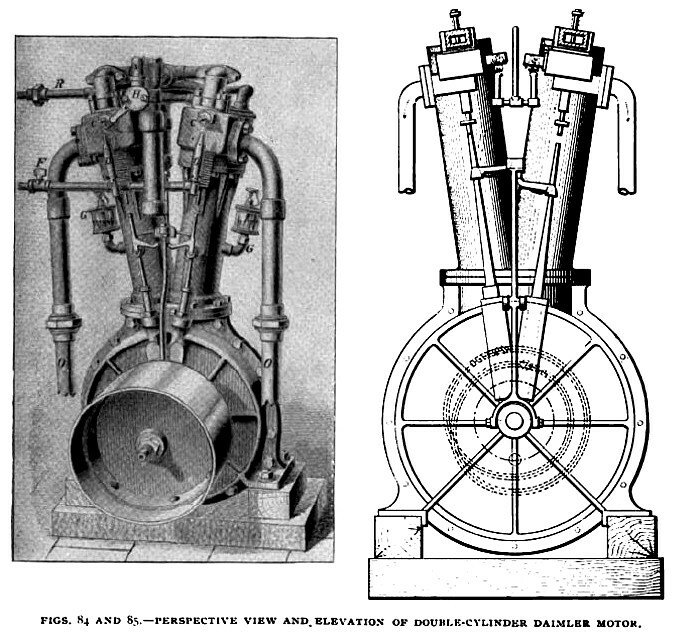 The cylinder in this early design was open at each end and had two pistons connected by curved levers and short connecting rods to one crank pin. The pistons both traveled in the same direction but at very different speeds. When at the outer end of their stroke, they remained almost at rest for nearly half a revolution of the crank pin, but when at the inner end of the stroke they traveled rapidly. 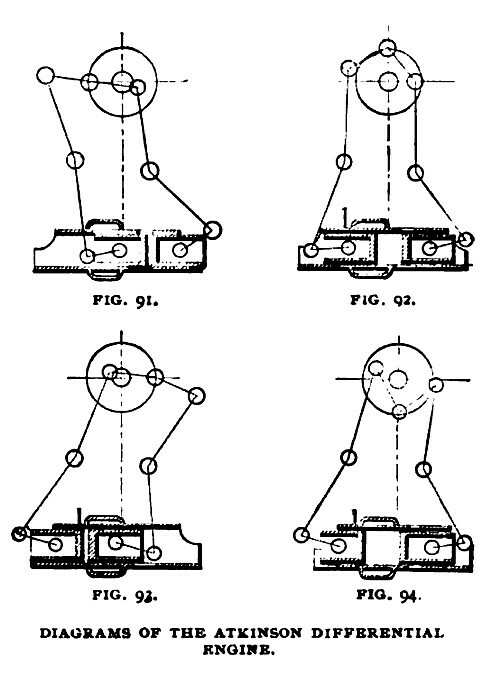 When the pistons had completed a stroke to the right, as in Fig. 91, they almost touched each other, and had driven out the products of combustion of the previous working stroke through a port in the cylinder wall. The crank pin was, at this time, on the left, and as it proceeded upward and around to the right, the left-hand piston moved rapidly away from the other, leaving a space between them into which the gas and air mixture was drawn through a self-acting suction valve. When the crank pin had reached its highest position, as in Fig. 92, the right-hand piston traveled past and closed the openings to the suction and exhaust valves, and during the next quarter turn the pistons again approached each other, Compressing the explosive charge between them, the crank pin by that time being over at the right-hand side, as in Fig. 93. At the moment of greatest compression, the left-hand piston passed an opening to an ignition tube which produced explosion of the charge, and an immediate, rapid stroke was made by the right-hand piston and was completed by the time the crank pin arrived at the lower quarter, as in Fig. 94. The exhaust port was then opened by the continued travel of the piston, and the contents of the cylinder were driven out through the self-acting exhaust valve by the left-hand piston, which assumed the position shown in Fig. 91, the whole cycle being completed in one revolution of the crank-shaft. The space between the pistons into which the ignited charge expanded was nearly double the space into which the charge was first drawn previous to explosion; consequently, the expansion amounted to nearly twice the original volume, and the terminal pressure at which the gases were expelled from the cylinder becomes very low. It will also be observed that the total expansion to twice the original volume took place in a quarter revolution of the crank-shaft as compared with other gas engines and this expansion to double the original volume was accomplished in one-fourth of the time taken for the same degree of expansion in other engines, assuming the engine to run at the same speed. The economy to be gained from the extra expansion is obvious, while the saving due to the rapid motion of the piston is also beyond question, having been conclusively demonstrated experimentally by a French authority. ProfessorWitz, a number of years ago. Without going in detail into the experiments made by him, it may not be uninteresting to here briefly state that in one series of experiments he used a mixture of one volume of illuminating gas and 6.33 volumes of air—a not unusual proportion for gas engines. This mixture was drawn into an experimental cylinder and exploded, the piston being allowed to travel at the rate of 1.7 meters per second, corresponding to an ordinary piston speed in a medium sized gas engine. The actual amount of work done was estimated from a diagram obtained from the cylinder. He then increased the speed of the piston, and found that by allowing the piston to move at the rate of 4.3 meters per second, or 2.54 times as fast as before, the same amount of gas did 2.9 times as much actual work. This large increase is chiefly due to the fact that the heat of combustion of the gaseous mixture is, at the higher speed, not allowed to continue so long in contact with the walls of the cylinder which are kept cool by the customary water jacket. It has been held that more than one-half of the total heat in the gas, even if thoroughly consumed, is lost by transmission to the water. If then the work is done in one-fourth of the time, as in the Atkinson engine, three-fourths of this serious loss must be saved, since the transmission of heat through metallic substances is directly proportionate to the length of time that the differences of temperature exist; hence, the great increase of power shown by Professor Witz's experiments. The engine in its early form was extremely simple. There were no slide-valves, nor were there any complicated substitutes, the working charge being efficiently controlled by the pistons passing the ports to the two self-acting valves and the port to the ignition tube. There were also neither cams nor eccentrics. In the course of the last few years, however, the design of the engine has undergone some changes, so that at the present time its appearance is like that shown on this page. 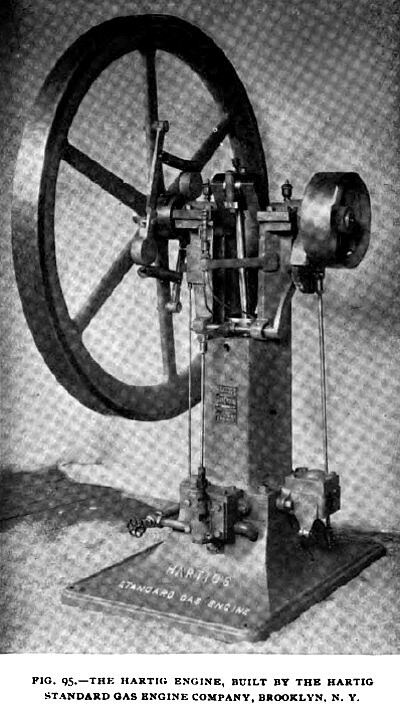 The " Utilite" gas engine, built by the same firm, was not designed as a rival to their standard engine, but simply as an alternative motor for obtaining practically the same results and, to a certain extent, to meet the varied views of buyers of gas engines. 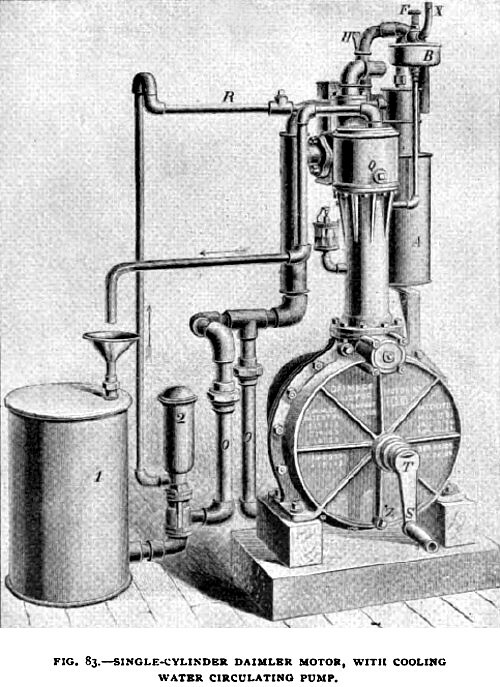 Perhaps the most distinctive feature of this later engine is found in the fact that the crank end is cased in and the space thus afforded is used as an air chamber whose supply serves to flush out the cylinder after each working stroke, the waste gases being allowed to escape through an opening in the side of the cylinder uncovered by the piston in its travel. There is thus no exhaust valve of the usual kind. 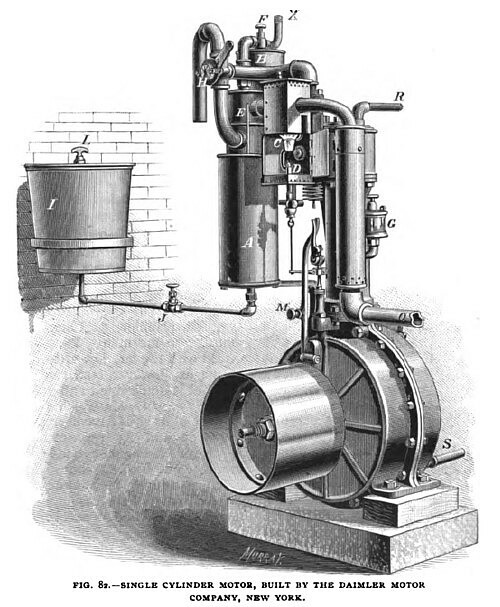 After the flushing of the cylinder has taken place, a small charging pump delivers into the firing end of the cylinder a rich mixture of fresh gas and air, the air proportion, however, being insufficient to permit explosion until it has been further added to. The piston, after having made a working stroke, returns and is allowed to expel through the exhaust opening some of the cylinder contents which, at the piston end of the cylinder, are made up of waste products of combustion or, perhaps, simply air. At about half the return stroke, however, the piston closes the exhaust opening or port, and what then remains in the cylinder is air and gaseous mixture in more or less definitely separate layers, the gas mixture being in the firing end of the cylinder, and the air alone, in the piston end. 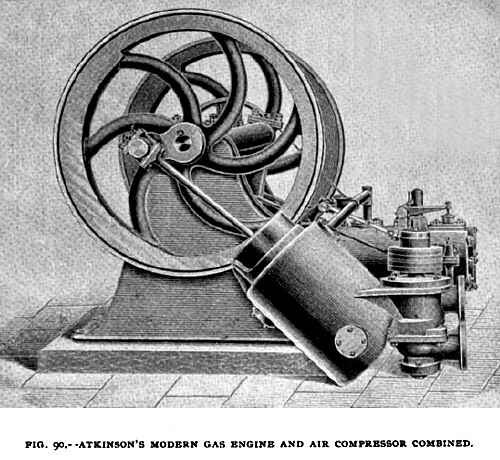 As compression takes place, the air and gas and air mixture become more intimately mixed and by the time the cylinder contents are fully compressed they are in a proper condition for ignition which then takes place; a working stroke is made in this manner once for every revolution of the crank-shaft. A small valve, in addition to the exhaust opening in the cylinder wall, controlled by an eccentric, allows a portion of the air to be removed from the cylinder before the compression stroke is completed, so as to leave only about one-half the original cylinder contents shut up, which, after compression and ignition, is allowed to expand to double its original volume. As a result, the diagram from the engine is practically the same as the diagram from the regular Atkinson engine, and the economy of the two is claimed to be practically the same. It is further claimed for the “Utilité " engines that they combine great lightness with rigidity and that they can be run at very high speeds without heavy foundations and without causing any trouble from excessive vibration. Speeds as high as 600 revolutions per minute are claimed to have been maintained with good results. 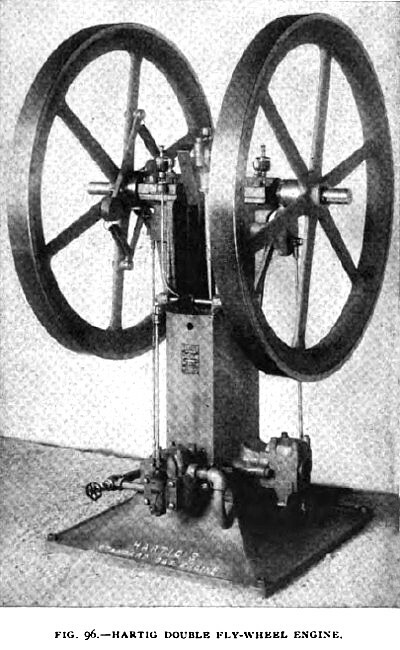 One of the later types of vertical gas engines is that made by the Hartig Standard Gas Engine Company , of Brooklyn, N. Y., both single and double fly-wheel designs being shown in Figs. 95 and 96. There are, in all, four valves in this engine,—a governor valve, automatically controlling the gas supply according to the amount of power required, a lighting valve, a gas and air admission valve, and an exhaust valve. The governor valve is in the main gas supply pipe and is worked by the vertical rod shown at the extreme left of Fig. 95. The governor itself is of the shaft type, the centrifugal force of the two weights being restrained by springs attached to the weight arms and to the weights in the manner indicated. With increase in speed above the normal, the weights move outward, and revolve a cam, mounted on the crank-shaft and provided with a helical groove and pin arrangement which causes the cam to slide in and out along the line of the shaft. When moved inward, that is, from left to right in the engraving, the cam comes in contact with another and smaller cam, directly connected with the main gas valve rod, and causes the valve to close more or less, thus shutting off the gas supply or simply reducing its volume, and consequently bringing about a decrease in speed. With the lower speed the governor weights return to their original position, the cams are thrown out of contact, and the gas supply valve is again opened. The exhaust valve is worked by the rod shown furthest to the right in the engraving, and receives motion from the crank through the intervention of two gear wheels, one of which has twice the diameter of the other. The valve is thus opened once in every two revolutions, the engine working on the Otto cycle. The valve rod connects with a valve lifting arm pivoted at one end, and, in its upward motion striking the valve spindle from below and lifting the valve from its seat to which, ordinarily, it is held by a spring. The igniting valve at the front of the engine is operated by a rod connected with a rock shaft, mounted on the engine frame as clearly shown, and receiving motion from the crank shaft through a rocker arm and cam gearing. The igniting gas jet burns at the side of this valve and, at the moment of valve opening, communicates with the explosive mixture in the cylinder and fires it. The gas and air admission valve, located almost directly behind the igniting valve, is not worked by any rod or gearing, but opens under the influence of the partial vacuum formed in the engine cylinder during the suction stroke of the piston, and closes of its own accord during the compression period, remaining also closed, for obvious reasons, during the working and exhaust strokes. The valves all are of the lift type, insuring lightness and freedom from sticking and clogging. The engine is made in sizes of from one to eight horse-power, though a small half horsepower pump and engine combination is also turned out. Experience with this engine has shown that it is well adapted to the driving of electric light dynamos, and it is for this work that its builders make one of their strongest claims, being specially prepared to furnish gas driven, isolated electric light plant outfits. A petroleum engine in which the now so widely used Otto cycle is not followed is that built by Messrs. Penney & Co., of Lincoln, England, and known as the Weatherhogg engine. In this a practical application is made of the six-stroke cycle, already referred to in one of the preceding papers, a scavenger charge of air being taken into and discharged from the cylinder during the interval between exhaust of the products of combustion and the admission of the working charge. The oil is injected into a vaporizer by a pump, which acts only when the speed of the engine is normal or less, being operated by a hit-and-miss device controlled by the governor. The oil is delivered into a coil heated by a blowpipe flame, and is there vaporized under pressure. The flame is produced from a spray of petroleum, and is fed by compressed air from a pump, which can be worked by hand at starting. When starting the engine, a handle is fixed to the crank, which works the pump, and it is rotated by hand for a few minutes, until the coil is hot. The oil is then injected and the vapor is allowed to accumulate until it attains a considerable pressure, which is maintained during working. It is claimed that better results are obtained by this pressure, and that it enables crude petroleum to be used if required. The pressure can be regulated by adjusting a throttling device at the outlet of the vaporizer. Between the vaporizer and the cylinder is the air admission valve, contained in a box in which mixture of the charges take place, ignition being effected by a heated tube. In some cases a part of the air is taken from a box in which the crank and connecting rod are enclosed, and in this way any leakage past the piston is caught and prevented from escaping into the engine room. 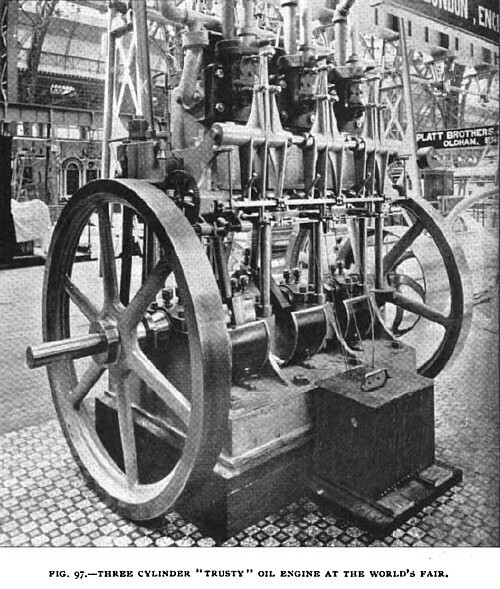 In connection with the "Trusty" double-cylinder oil engine shown in the June number, it is of interest to direct attention to a vertical, three-cylinder oil engine built by the same firm, Messrs. Weyman & Hitchcock, of Guildford, England, and shown at the World’s Fair at Chicago. The principle of operation is essentially the same as that of the engine already described. The three cylinders are connected to a three-throw crank shaft, with the cranks set at angles of 120 degrees, so that the work of the cylinders is well distributed throughout the period of each revolution. The valve gear is worked from a cam shaft driven by worm gearing, but each cylinder has its separate cams so that any one of them may be cut out at will.